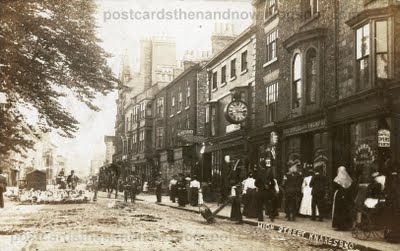 Knaresborough, North Yorkshire, High Street circa 1910. A busy street scene by an uncredited postcard publisher. Notice the geese on the left-hand side of the picture. Postcard courtesy of the Ken Lea collection. Click the picture to enlarge. What a fantastic card. There's so much going on there-and a flock of geese. Beam me down, Scottie. I can hear this card! What a clatter and noise!